‘Once upon a Tide’ is a variable, restless, shifting narrative. Turns of phrase, stage directions, and lines of dialogue from Shakespeare’s The Tempest (1610-11) are randomly, repeatedly, and somewhat enigmatically recombined within a close, tense, ship-bound setting reminiscent of Joseph Conrad’s The Secret Sharer (1910), or The Shadow-Line (1916). On the deck of a ship off the shore of an island, two interlocutors are closely observed by a narrator who remains hidden from view. 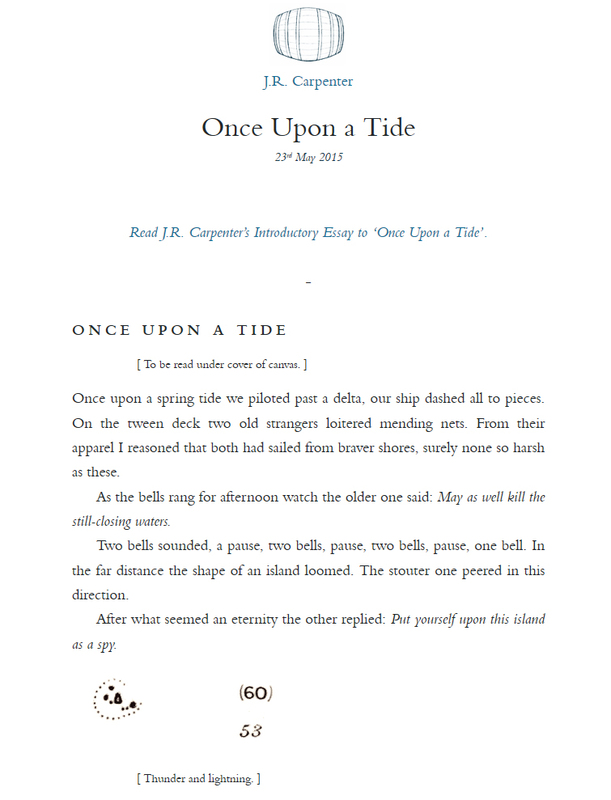 Not quite a short story, not quite a stage play, ‘Once upon a Tide’ is just one of those moments in literature when time … stands … still. Once upon a perigee tide we sailed past a lagoon, our ship charmed. On the forecastle deck two stout men sat mending nets. From their looks I wondered that they had come from calmer shores, certainly none so desolate as these. Once upon an apogee tide we piloted past a cliff, our ship a brave vessel. On the poop deck two mean boatswains squated twisting tales. From their looks I assumed that the pair had set out from foreign shores, certainly none so harsh as these. Once upon a spring tide we piloted past a delta, our ship dashed all to pieces. On the tween deck two old strangers loitered mending nets. From their apparel I reasoned that both had sailed from braver shores, surely none so harsh as these.